So, I’ve never had spaghetti squash before. It is one strange vegetable. A squash that peels apart into strands of spaghetti. Imagine that. This fall I thought I’d try my hand at one. They seemed fairly simple to prepare, just cut open lengthwise, poke a few holes in it and bake, cut side down for 45 minutes to an hour at 375°. No one mentions how hard it is to cut these things in half. Not easy at all. With a little bit of difficulty though, I finally managed. I also put about 1/4 inch of water in the bottom of the baking sheet to help soften it. When it is done, you should be able to insert a sharp knife into the outside easily. Remove from the oven and let cool enough so that it can be handled. Scoop out seeds with a spoon and discard. Then comes the fun part. Using a fork, scrape down the flesh of the squash lengthwise. It will come out easily in strands. I then sauteed the squash in some Earth Balance with minced garlic, basil, salt, pepper and chervil. 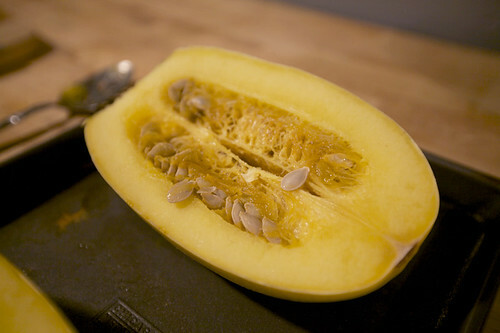 Though it may seem like you have a great deal of squash, it cooks down significantly. I wanted to add something else into the mix so I also added some baked mochi. I had bought a package of brown rice mochi at the store thinking it was a very different thing than what I got. The mochi, when baked, puffs up kind of like a pastry, but has a sort of gelatinous explosion from it’s center. It’s very strange. I threw my strange mochi puffs in with the squash as it browned in the pan. The bizarre combination actually tasted delicious. The mochi had a very light flavor and gave some volume to the dish, making it more filling without complicating it. The squash is rich and autumnal. It isn’t as dense as other squashes but still has the same texture. I’m still intrigued and want to try some more recipes with it; perhaps a casserole. I also had my first spaghetti squashes this year! Your dish sounds amazing…now I need to get me some mochi. I’ve never had spaghetti squash, never see them in the shops or markets here. I would so love to try it though. Your little image made me laugh so much. my Italian dad always made this for me when I was growing up! It is so fun to scrape the “spaghetti” out of the squash! i’ve never had mochi before though, I’ll have to check that out. I just put the squash in the oven whole. poke a few holes in it with a knife so it can ‘breathe’. I cut it and scrape out the seeds once it is already cooked. That way it stays moist and there’s almost no prep! 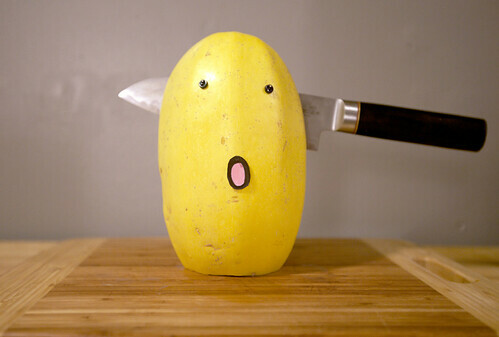 How could you stab Senor Spaghetti Squash in the head?! Murderer! Spaghetti squash might be a bit of work, but it’s totally worth it. The last time I cooked it, I actually did it in the microwave and it came out just as good, and took way less time! 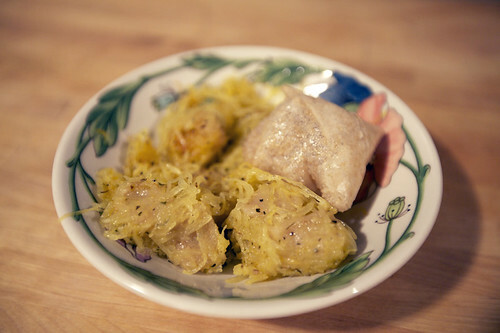 I tried my hand at spaghetti squash last year and nearly killed myself in the process. I got the knife stuck in the squash twice, nearly panicking about how I would possibly wrestle it out again, but time and patience worked. Someone suggested putting the whole squash in the microwave to soften it up a touch before slicing it open. I’ve made mochi before, too. It’s an odd thing, but very good! 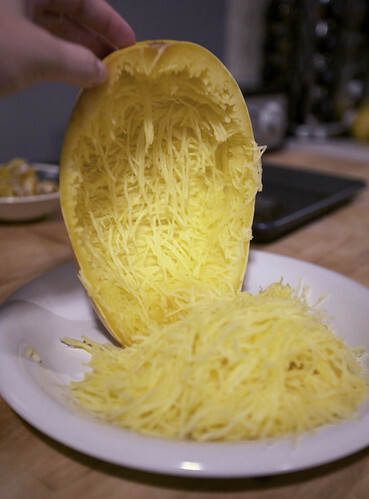 I love spaghetti squash and I usually pierce it and then cook it whole to avoid cutting it in half at the beginning. That works really well. That first picture alllmost made water come right out of my nose. Just sayin.